Today I’m happy to have Brad Moss on the show. Brad recently spoke at my conference, The Sellers Summit, this past year, and his presentation was very well received by the attendees. He’s the former head of Seller Central at Amazon and he has intimate knowledge of how Amazon works from the inside. And today, he’s the founder of ProductLabs.net where he helps Amazon sellers blow up their businesses. Anyway, Brad is an awesome guy and he’s got some crazy Amazon stories to tell as well. Enjoy the episode! Guidelines for a good Amazon conversion rate. How to diagnose your conversion problems. Kabbage.com – If you run a physical products based business, sometimes you need a short term loan to buy inventory to meet demand, especially during the holiday season. Kabbage helps small business owners access simple and flexible funding right away. Click here and get a $50 Visa gift card upon signup. You’re listening to the My Wife Quit Her Job Podcast, the place where I bring on successful bootstrapped business owners, and delve deeply into what strategies are working and what strategies are not with their businesses. Now today I’m thrilled to have Brad Moss on the show. 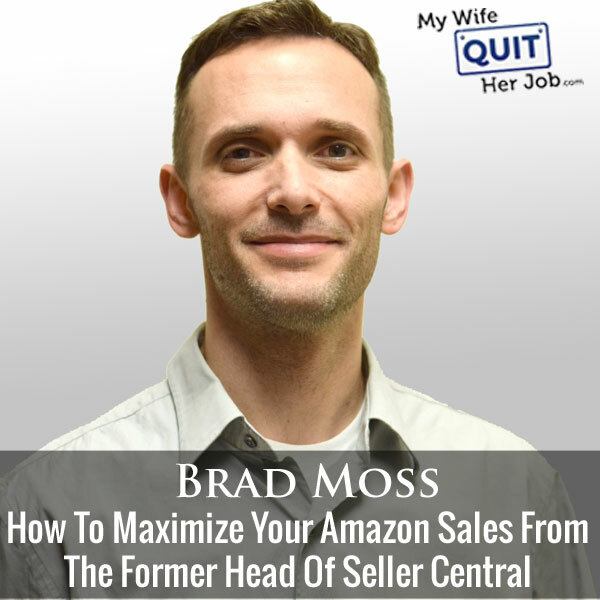 And Brad is an ex Amazon employee who was the head of Seller Central. So he has intimate knowledge of their inner workings. And today we’re going to discuss what it takes to maximize your sales on Amazon. But before we begin I want to give a quick shout out to Privy who is a sponsor of the show. Privy is the tool I use to build my email list for both my blog and my online store. Now what does Privy do? Privy is an email list growth platform, and they manage all of my email capture forms, and in fact I use pretty hand in hand with all of my email marketing providers. Now there are a bunch of companies out there that will manage your email capture forms, but I like Privy because they specialize in e-commerce. Right now I’m using Privy to display a cool wheel of fortune pop up. Basically a user gives their email for a chance to win valuable prizes in our store. Customers love the gamification aspect of this, and after I implemented this form, email sign ups increased by 131%. Now there are other cool things that you can do with Privy also. So for example let’s say you offer free shipping for orders over 100 bucks, well you can tell Privy to flush a pop up when the customer has $90 in their shopping cart to urge them to insert one more item. So bottom line, Privy allows me to turn visitors into email subscribers, which I then feed to my email provider to close the sale. So head on over to Privy.com/Steve, and try it for free. And if you decide that you need some of the more advanced features, use coupon code MWQHJ For 15% off once. Once again that’s P-R-I-V-Y.com/Steve. Now I also want to give a quick shout out to Klaviyo who is a sponsor of the show. I’m always blessed to have them as a sponsor because they are the email marketing platform that I personally use for my store, and I depend on them for over 20% of my revenues. Now, Klaviyo is the only email platform out there that is specifically built for ecommerce stores, and here is why it is so powerful. Klaviyo can track every single customer who has shopped in your store and exactly what they bought. So let’s say I want to send an email to everyone who purchased a red handkerchief in the last week, easy. Let’s say I want to set up a special auto-responder sequence to my customers depending on what they bought, piece of cake, and there is full revenue tracking on every single email. Now Klaviyo is the most powerful email platform that I’ve ever used and you can try them for free at mywifequitherjob.com/K-L-A-V-I-Y-O, once again that’s, mywifequitherjob.com/K-L-A-V-I-Y-O. Now on to the show. Steve: Welcome to the My Wife Quit her Job Podcast. Today I’m thrilled to have Brad Moss on the show. Now Brad was actually a speaker at my conference, the Sellers Summit this past year, and his presentation was very well received by the attendees. He is the former head of Seller Central at Amazon, and he’s got intimate knowledge about how Amazon works from the inside. And that’s one of the reasons why I wanted to have him come on the podcast today. Today he’s actually the founder of productlabs.net, where he helps Amazon sellers to [inaudible 00:03:35] their businesses. In addition, he has some software under development that analyzes your account to see how you can improve your sales. Anyway Brad is an awesome guy, and he’s got some crazy Amazon stories to tell as well, which he kind of shared with me at the conference. They are really entertaining. And with that, welcome to the show Brad, how are you doing today man? Brad: Thanks Steve, that’s quite an introduction. I’m glad to be here. Steve: So one thing the listeners don’t know is like you just had a newborn, and then you kind of flew out the family over the conference with like a newborn baby. So how’s the baby doing? Brad: The baby’s great, the baby’s great, and more importantly, my wife is still holding in there. Steve: Yes, your wife is a saint. Brad: Yes she is, she is, but yeah the bam is awesome, and he’s great. Steve: So give us your quick background story for those listeners who don’t know your back story. Tell us about your stint in Amazon and why you decided to start Product Labs. Brad: Yeah sure. So do you want the long or short version? Steve: Let’s – I’ll cut you off if it gets too long, how’s that? Brad: Okay, it sounds good. So I started on Amazon maybe five years ago, five and a half years ago. And I actually started on Amazon, I come from an entrepreneurial background, and I actually had a game development studio before. And I worked in video games for a while. And so when I started on Amazon, they actually tested me with a project called a seller gamification. And it was a really cool concept, and I worked on that for about six months. And we were a day before launching when some middle management stuff happened at Amazon. That never happens at a big company right? The day before launching, people were fighting over this engineer who is Nike engineer, and my side lost. So we never launched that, and I think you guys would’ve seen a lot of really cool stuff from that program had it launched, but it never did. Nonetheless, it got me really intimately familiar with Seller Central and how the system works, because we had to build this program into Seller Central. And so from there, there was no head of Seller Central, there was no business leader over Seller Central. And from there we said, well this is a natural transition and Seller Central was pretty terrible in certain places. And so I moved into that role. And so I ran Seller Central for a while and tried to make some improvements. And it’s quite a hard thing to wrangle. There was over 167 different systems that are running inside Seller Central at the time, and there was all these different teams inside there. So I was trying to, or I had to set the rules and guidelines for these teams, and they’re doing things coming on especially external teams coming into our org [ph] to build some stuff inside Seller Central. Seller Central is okay. I wish it was much better, and I had a lot of things that I wanted to do to improve it, but you can only do so much inside a big company. Steve: Can you give us an idea of what the environment is like in there, and what it’s like to work there kind of? Brad: Sure. So for example — well it’s pretty neat in that being the lead they gave me quite a lot of responsibility, and they did that, but then they put the whole burden of proof and reasoning on my shoulders as well. So as a business lead, I would say, hey I want to change this widget to — I wanted to change the front page of Seller Central to no longer show that whole middle bar, and they’d say why. And I have to have a business case behind it and say, well if we get rid of it, they’d have to have the numbers behind to say, well if we get rid of that, we’re going to see an improved what we call GMS, which is like GMB. It’s total sales in the system — would improve GMS of five million dollars if we do that. Well that’s not good enough because of XY and Z. So I owned the program, but I had to prove all the stuff that I wanted to do and why I wanted to do it every step of the way. And I had to prove to my manager. My manager was typically on board, but I have to go — sometimes it was big stuff that we were changing. I have to go, run it past a VP or the senior vice president. So Sebastian Gunningham was senior vice president at the time. I think he still is, and we talked about changing the whole head, the header, the whole head, the top part of Seller Central. And we did, and we made it mobile friendly, well on certain pages so that if you looked on your mobile phone, you could actually navigate. Certain pages don’t work, and you still can’t quite navigate them on your mobile phone. But we made this refresh of the whole top nav, and we presented that to Sebastian and some of the reasons why, and his navigation and what sellers would see as an improvement from there. Steve: So everything is very metrics focused, like every decision, right? Brad: Exactly, so it wasn’t like, hey I want to make this red because I like red better. It was that would never fly at Amazon. We have to do an A/B study. For example we on boarded that PPC, the product sponsored product system. Those guys wanted to come into Seller Central; they wanted their own title at the very top. There’s inventory and orders, they wanted their very own, and right now you’ll see one that says advertising, right? We put that in there. We actually thought the word marketing was a better word, because we wanted to put other stuff inside that tab aside from just the PPC, sponsored products. And so we did an A/B test between marketing and advertising, and users. We found that users recognized the term advertising a lot more clearly than marketing. And so that’s why it’s named advertising today. Steve: I just want you — I’m just curious like whenever they make these huge announcements and whatnot, all the decisions that they make, do you guys, do you always have to run tests to see how it effects revenue before any sort of decision is made? Brad: Not always test. There’s many times there’s theories. And that might mean — and that can lead into my next role which I did which was mobile. So because I ran Seller Central, I got to know that really, really well. And then the question always was mobile, how do people access Seller Central, their accounts on mobile. And so I then picked up the business case, said okay well, is there a business case to make Amazon to make a mobile version of Seller Central. And today everyone — the end of the story is, yes there was because we have the Amazon seller app today, and that’s what I built. But it was a hard business case to make. I based it on several different factors, and to give you a little bit of perspective. When I first started at Amazon, I noticed this one page on Amazon that no one was paying attention to. And I said, hey if we do some updating here, it’s going to be a $30 million opportunity, the analysis that I did it. And then my manager just laughed at me, he said no, we’re not going to do that. I said why? It’s got to be a billion dollars in three years. Oh we’re not going to do it at all. I said, oh that’s a high bar. So with mobile, my question that was running through my mind the whole time was like, well, can we build something that will grow to be a billion dollars in increased revenue for Amazon in three years? And so with mobile, the case came down to, well the arbitrage seller, the sellers who go — might go to Costco, and they scan something, they say, hey look. this is selling for $10 cheaper on a Costco than it is on Amazon. If I buy it and then I list it on Amazon I’m going to make an extra three bucks on buy box. And so whenever someone did that, that product got rolled into our program, and that’s an increased value when someone purchased that product that they listed through the app. That got attributed to our mobile program, and that started growing. That was part of the revenue. Brad: For the increase we had 300 million which we mentioned here. So that was one of the cases. Steve: It sounds like the decisions are all like macro, like if it’s not going to be a huge difference, then Amazon is not going to bother even doing it. Brad: Exactly, well at least at least from someone like in my scenario, in general yes. Sometimes there’s even a bigger macro like strategic vision somewhere that Jeff Bezos sets out, or his team sets out and every one of those come in and there’s like no dollar values tied to them. They’re just like we just want to do this. Steve: Right, that makes sense. Brad: It comes from Bezos, and then they do it. But most of the time, there is a strong business case behind why are we — why someone is doing stuff, why these new announcements come out, and these new programs are launched. Steve: I mean so let’s switch gears a little bit. And so you left the company what, five years ago, and then you decided to start Product Labs where you kind of help Amazon sellers, what was the impetus for that? Brad: For leaving — I mean for leaving the company I’ve done maybe a major [inaudible 00:13:05]. I’ve done some pretty good work with some really good teams there, and I decided to move on. I mean again there are some middle management fighting that starts happening especially when you have a successful program. And so I didn’t really want to deal with that too much, and also there were some family reasons that I wanted to move back to Salt Lake City. So I left, and as soon as I left, I had a lot of people that just started pinning me that I had just known casually. And they said, hey I need to understand stuff on Amazon; there are so many problems here. And having known the system on Seller Central, and how difficult, tremendously difficult a lot of the things can be — that said they’re getting better — some of them are slowly getting better, right? But some of the systems are so hard to understand, it’s such a steep learning curve. I realized there are a lot of people that just needed this help. And so I just started with a few clients and said, sure, I’ll able to help you get things up and rolling. And we got them up and rolling and they saw some great success. And then I pulled a partner and it’s another ex Amazon business lead, his name is Tim Hughes. He was at the conference. Brad: Yeah you met him. And so I pulled him in and said, hey let’s do this and grow this, and I want to build some software that’s tied into everything that we’re doing. And so Tim has been hitting up a lot of the software side of things. And so yeah, it just slowly started to grow from there. Steve: So Brad, I know a lot of people come to you and you’ve helped a lot of Amazon businesses grow. I was wondering if you could kind of walk me through your process of when some someone comes to you, how you analyze their account and come up with action items on what to change. Brad: Yeah sure. So this has been — when we started, this is always the biggest question. And part of what I talked about at the conference was we’re realizing everyone has their own opinions of what you should be doing, and a lot of them are really good. And it turns into this huge list of 50 things that I got to do you right now to improve my business. And being overwhelmed like that and having the kind of Amazon training and experience that we ha, whenever you get overwhelmed, it means there’s no structure, and that you don’t really know what’s going on in the operations of your business. And so we created this kind of a map to the whole Amazon system and what works, and what is driving what. So one of the key things at Amazon whenever we’d build these decks, these metrics decks that we review every single week, that’s how the whole business is run is through these metric stacks. We would identify what we call inputs and outputs. So inputs are things that you can change. For example like a good picture on your detail page, or like the title of your detail page. You could go in there right now and change that. But that’s going to drive something, and so the question is what’s the output that that’s going to affect. And so we went through and we did analysis on the whole selling cycle inside Amazon. And we’ve built kind of a framework where we’re looking at, oaky what are the inputs and outputs. So for example if I change a picture, that is actually going to affect my conversion rate on my detail page, right? And it’s not actually going to be changing my sessions or changing my costs. And so we need to understand where things are broken first. So we actually do a breakdown, we look at the health of these output metrics. So the key ones that we look at are, one the conversion rate, and what the conversion rate is. Steve: What’s a good conversion rate? Brad: Ten percent or above is what we give an A.
Steve: Does that apply to all categories or is that like a general guideline? Brad: Yeah that’s a general guideline of what we found. Yeah I’ve seen this high of 60% on some, and I’ve seen some miserable ones too. Steve: What would you consider something that definitely needs improvement, like a conversion rate? Brad: So 4 or 5% definitely needs improvement. Even six and seven probably need improvement, you can improve it. Brad: These conversion rates are crazy that you’re quoting compared to like the average conversion rate for a standalone store, which hovers around 2 to 3%? Brad: Yeah you’re right. It is the average retails at around 3%, and these conversion rates, I don’t know if it has to do with your further down the funnel inside Amazon, and so when someone is clicking on your page, they’re much further down the funnel hence the conversion rate is higher. But this is the conversion rate inside Amazon that we’ve got a metric that we’re gauging this on. Steve: Okay, and so you go through someone’s products and then you just kind of point out conversion rates that are below ten? Brad: Yes, so we look at what your conversion rates are for all your products, and the number of sessions for all your products, so this one is very specific by category, the number of sessions. So how many people are visiting your page because really if it’s conversion rates time sessions equals the number of sales, right? That is simple math. But that’s how we’ve broken it down that way. So if you’re looking at sessions, there’s a kind of a threshold of sessions. We actually look at the market, what the other sellers are doing in your market and the number of sessions that they’re getting, and where you are and if you’ve achieved similar sessions to them or not. And that’s kind of the threshold. But when you want to talk about generality sessions, around 3,000 sessions is typically good for most categories, 3,000 sessions a month. Steve: How do you determine how many sessions like a competitor is getting per product? Brad: So we do research on their products, and we use some tools that give some approximation of what their sessions are. [Overlapping 00:19:06] It’s going to be based those — yeah based on their BS R, and conversion rate and sales, we triangulate kind of where their sessions are. Steve: How do you know what their conversion rate is though? Brad: Well that’s part of — we do some analysis on some of the detail page, and we give some estimates. Brad: It’s not exact numbers; we don’t have those numbers, so we do what we can. Steve: These are kind of subjective based on the quality of the listing, right? Brad: Yeah, and based on where they are on the listing. So, we’re looking at the top sellers, and we know that in general top sellers have a higher than 10% conversion rates. The question is how much higher do they have? Steve: Got it, got it. Okay and so you’re comparing the number of sessions that you’re getting versus a competitor to see where you kind of lie in that curve, right? Brad: If you’re far off from the leader, then you’re probably doing something wrong? Brad: Yeah, and one of the things that we tell people is it’s hard to hit a homerun every time, and my expect — I think it’s an unrealistic expectation to expect a home run every time. Now a lot of people want homeruns every time, but it’s very difficult and it’s actually can get really spendy. And when I say homerun, I mean become the number one seller of your product in particular category. So we’ve set our thresholds at a spot where you’re going to be in the top quartile of sellers of your product, and that’s kind of hitting in A in our book. Now you can get beyond that which we call super if you’re doing beyond that, which means you are — you may be the top one or two sellers in the category. But you’re going to be up all night if you’re always trying to be and you’ll never achieve that if you’re always trying to be number one in every single category that you’re in with all of your products. Steve: It seems like 3,000 is kind of like an arbitrary number, because what if you’re selling something that just doesn’t get that much search volume, you’re never going to hit that, right? Brad: Yeah, so that’s why we — this discussion is much more based on the competitors and the particular type of product. And so I just threw out the 3,000 and that’s a good general — it’s a general number of most products that we’ve seen. But it has a much wider standard deviation, the sessions does versus the conversion rate. Steve: Okay, so assuming that – okay so let’s say the sessions is kind of like far off from the lead, like what are your next steps? Brad: So we’ve identified — so for conversion rate there’s basically four inputs, what we call inputs that affect the conversion rate, and for sessions there’s eight different inputs. And so for sessions, we break things down into two categories either organic traffic, so traffic that’s just coming from people generally searching the Amazon catalog. Or influence traffic and that’s traffic that you’re paying for or that you’re pushing into Amazon. And so, each one of those has basically four categories of inputs. So if you are getting — for example if you’re not doing very well and part of — so I’ll step back a half step. Part of our assessment we look at where your sessions are coming from. So we analyze if it’s coming from just native Amazon clicks, or if it’s coming from advertising clicks. And there’s a ratio there. So if over 50% of your clicks are coming from ads, you’re really dependent upon ads and there’s probably something wrong with your organic listing, because people aren’t even finding it by doing the normal search result. Steve: What’s a good ratio of organic for paid then? Brad: So I would say between, I mean 50 is probably about as far as you want to go. And again there’s another component here of strategy. If you want to push really, really hard for a month or two, and so you’re doing tons of paid ads, then you can expect this to go up. But in general that will come back down, and it should be around 30%, 30 to 50% of organic versus influence, or paid traffic. Steve: And the 3,000 number you kind of threw out earlier, that’s for both components, right? Brad: So then for the organic for example that’s low, then we say, okay what’s going on with your — there’s four different things. One is the title of your listing, that’s going to affect your sessions. The actual keywords, the keywords inside the content of the detail page, that’s going to affect your organic ranking. And the keywords in the back end and not just keywords, but the other components in the back end, we fill those out before weighing, and you may need to adjust those. And then the last thing is the categorization sometimes can be off, and that will pull you out of the organic ranking, the right way that you — of where you should be. Steve: So how do you test, like in the back end for example, let’s say you’re choosing the wrong keywords, if you were to just have someone change those, do you change a bunch of them and then see what happens, or do you just change one at a time? Brad: So because the results take — I mean it’s a question of A/B testing that you can’t fully A/B test on Amazon at any point. It’s more of like you make a change and then you see what happens, and you make a change and you see what happens. Because of that, we usually change several keywords at a time. And it may not be all of them, it may not be, hey all these keywords are bad. It may just be, hey there’s a few more we want to add in here, so let’s try these. Let’s adjust these and test it for the next several weeks, and see how your organic ranking is improving or decreasing. Steve: Okay. And then the other thing you said was words within the content. Does that imply that the description and the bullet points are getting considered for keyword? Brad: So the ABC is not getting plugged, the enhanced content stuff is not getting indexed, but the descriptions are, and the bullet points still are from everything we’ve tested. Steve: Okay, so it’s in your best interest then to write out a flashy description? Brad: Yeah definitely, and it should make sense. I mean so for example this comes back to conversion rate, but the descriptions are so interesting, because it’s a mixture between driving sessions and driving conversion rate. We took a client from 4% to 10% in conversion rate just by changing the text in the description, and it was just the text. We didn’t change the images; we didn’t change the titles, just the text. So people do read some of this stuff. It doesn’t only — the images aren’t the only thing that matters. Steve: Was that a more complicated project that required more or better description though? Brad: It was a supplement, but it was a more complicated supplement. So I would say it was a unique supplement, more of an outlier in its field. Steve: Okay, that needed more explanation probably I would imagine. Steve: Okay that makes sense, that makes sense. Okay so let’s see, we’ve got — so we’re still talking about sessions, and you said there were four things for organic? Steve: And so title, bullet points, description, what is the forth? Brad: The listing back and then the categorization, how you have categorized. Steve: Okay yes. How do you figure out if you’re in the wrong category? Brad: I know there’s a lot of category hopping because people are really pushing to try and get Amazon badges out there. I’ve noticed Amazon cracking down on some of that too and they’ll move you in different categories where you need to be. Categorization it’s the same as — I don’t know if the real question is how do you know if you’re in the wrong category? The question is more, are you in the most effective category for your product? And sometimes you are and sometimes you aren’t. Steve: Okay, that makes sense. Brad: As the last resort. Steve: Okay and what is your view on enhanced brand content in general? Brad: So enhanced brand content is over on the conversion rate side. It should improve your conversion rate. And so I think it’s great, it looks good. As a consumer I like it, and when I’m looking at a product that I’m really interested in. I know it shows up pretty well on mobile if you’re looking at mobile, and a lot of people shop on mobile these days. That’s one thing that people need to always consider is the mobile shopper, because that is where I think it’s over 50% of traffic coming is from mobile. But the EBC is great, and if your conversion rate is low, we’ll definitely look at your [inaudible 00:28:34] content. Sometimes people have a terrific conversion rate, they may have a 20 or 30% conversion rate, and they want to do the enhanced brand content, that’s something that you can do. It may not be the top priority, but if everything else is already covered, then by all means add more enhanced brand content. Steve: That’s kind of private question more along the lines of if your conversion rate is already pretty good, like is it something that you should still spend time to implement over some of the other things? Brand: Yeah, so it’s a matter of stack ranking what you want to do, right? If your sessions are really low, I would not be ABC. I’d really focus on trying to optimize the organic sessions or the paid sessions that you’re doing. Steve: What about parent child, like does that fall under the sessions? Brad: Parent’s child does fall into the session side, the organic side. And that’s part of the categorization, we kind of lump those into the categorization as well. And everything that we’ve tried, I can’t speak to others experience, but everything we’ve tried always points to a benefit of having a parent child relationship for products. Steve: Interesting, because there are different schools of thought, right? You get more listings in the search results. Brad: Yes and no. I mean you get some more — your listings will still repeat in the search results. It’s just they may be lower. So you might still see your blue and your red socks. One might be a couple of pages later than your blue one. And they still both point to the same parent. And so the parent moves up. The idea is that everything kind of moves up because there’s conversion on it, or someone might discover the blue one. And then blue pulls the blue one up even though some comes in through the black. Steve: Right. Okay so in general you recommend that you try to do parent child in your experience at least. Brad: Yeah, that’s kind of a standard thing. We brought someone’s catalog, but then the first two months their whole business grew about 200%, and all we did was adjust the back end categorization of things. And that means parent child relationships, doing them the right way, and then adjusting just a few back end keywords, and their business grew 200% from what it was. And that was it that we know, that’s all we had done to get to that point. Steve: Are there limits to the parent child, so let me just give an example in my case. I sell napkins, could I put like similar designed towels within that parent child, like what are the limits and the boundaries of what you would do parent child with? Brad: So yeah that’s a really good question. I guess on the kind of the parent child, what do you dump in there, right? Brad: I mean I’ve seen some listings that probably have 30 different styles, and then each one of those styles has five different sizes in it. Some of those things are doing well. So the question — I don’t know if I have an exact answer for you. That would probably come into the point where it’s more of an art than a science, and what do you think the consumers are imagining here, or seeing here in the situation. Do you think they’re coming to that page and then converting over to the towels versus the napkins? And if they are, then do it by all means. Steve: But does it hurt to do that is actually what I was asking? Brad: It might be something to try, I don’t know, I don’t think I can give you an exact answer on that. It might not hurt it and it might hurt it. And parent child are not that scary. Having done them a lot, it’s actually not as scary as it feels to do them when you pull them in there. I mean it’s just — you create an ASIN, hold the children in, and if you don’t like it anymore, you pull them right back out. And they’re their own ASINS, because everything sticks on the same ASIN. Steve: So let’s switch gears and talk about conversions then. So what are some of the things that you’ve changed that have greatly affected conversions, like what are the inputs first of all? Brad: Yeah, so conversion rate for the four inputs we have identified are, one the listing, what the media is for the listing. So your pictures can be a really big deal. We bump conversion rates ten points or 20 points based on just changing a picture. And the top picture of a product. We brought one from 3 to 13% just by redoing what the main hero image was. Steve: Oh yeah, I can totally see that. Brad: Yeah and so pictures are quite a big deal, and that’s the first thing everyone always sees. So that should always be the — you should look at it with laser focus. And then the content, like I mentioned all the text inside there, so the bullet points and the detail page. And then the next one is the price or kind of put in a more general term is the value of your listing versus your competitors. So your price is actually going to influence your conversion rate up and down. If your competitors are all selling for a lot more money, and you’re selling for a lot cheaper, your conversion is going to go up, right? And vice versa, if your conversion rate is really low, and you’re $10 more expensive than the next guy, it could — that’s an indicator that really it could be your pricing issue. And part of pricing does come into are you relaying the value or the increased value of your product to the consumer? And if you’re not doing a good enough job, when the price is really where it’s going to yield. And we say, oh this isn’t really worth it, so I’m going to bounce this page and go buy from this other guy. Sorry did you have a question? Steve: Yeah I was going to ask you, what is your view on video? I’ve seen a lot more videos now on listings. Brad: Yeah, I think videos are great. If you can get them on there, I think they’re fantastic. It’s just additional rich media for your listing. Steve: When you add a video though, it’s always at the bottom, right? Brad: Yeah, the video shots, yeah those get clicked on quite a bit from what we’ve seen. Brad: And those — it’s when people are looking for more information about the product, they’ve looked kind of at the top and then they see a video that pertains exactly to your product right when they’re going down to look at some of the customer reviews. Because you scroll down, you’re about to look at some reviews, you’re like, oh here’s a video that might explain a little bit more about someone’s experience with this, or from the manufacturer himself. Steve: So if you were to prioritize all these things, like what is your order of hierarchy in terms of what you focus on? Brad: So, and then I’ll give the fourth one too, I just gave you three. The fourth one is customer feedback, so the stars that you have. And that’s actually an output too. It’s not necessary an input, you can’t go in there and change your customer feedback, right? There’s four additional inputs that affect your customer feedback, but customer feedback is another — one of the four metrics that goes into your conversion rate, reporting that you do. Steve: How is that an input again, sorry? Brad: Well customer feedback is not an input. Customer feedback is an output. And then I don’t know how deep you want me to get. There is four — we’ve identified four additional things that go into the customer feedback if you want that higher — if you want to get that higher. Steve: Maybe let’s come back to that first. Brad: Let me come back to that yeah. Okay sorry, so what was your previous question? Steve: The other priority in terms of like what in order of priority, yeah? Brad: We typically look at – well media is one of the biggest things that we see people struggle with, and even a brand that has a really well done pictures, sometimes is not displaying it the right way. For example, we were helping someone with a pillow, and it didn’t quite look like a pillow. It was a really fancy pillow, and didn’t quite look like one. And so we advice them and we had adjust the picture, the main picture, and so people kind of understood a little bit more that it was a pillow you sleep with, not the one you put on the couch. And that improved conversion rate quite a bit when we did that. So that’s usually the biggest offender is the visuals there. It’s either that — well it’s hard to say, because many people coming in, they’re running a business and the value side of what your price is, they can’t change the price or they have it listed really high, and they want to make more money on it, and they can’t come down, but the conversion rate is really low. And so if they can’t come down on that, that leads back to, well, how can we make the media look nicer or the content look a little better, or improve the customer feedback so that this is going to justify the high price point that you have. On that price point by the way, some people ask when to improve their price, and this is always a fun thing to discover. When someone has a really high conversion rate, that’s an indicator you can bump up your price. Now I won’t go crazy and probably destroy your listing, but that’s an indicator people are willing to spend a little bit more on your product if your conversion rate is so high. Steve: What do you consider a conversion rate where you would want to up the price? Steve: About 20%, okay. What is your strategy there, do you kind of slowly inch it up? Brad: Yeah, I mean we do kind of 50 cent increments, sometimes dollar increments. It depends on what their top price is. If they’re selling for $57, you might jump it up to $58, and watch the conversion rate over the next couple of weeks. Steve: I see, and that in general you’re doing the analysis on what generates the most revenue? Brad: Exactly yeah, and all this in puts into a big system we have that identifies what are their cost of goods, what are the returns, the whole cost side of things, which is a whole different equation. But we pull it all together, and do an analysis on what their net profit is and their profit margin is. Steve: Have you seen the conversion rate increase as a result of a price increase? Brad: I think I have, but I can’t think of any specific example. Steve: I mean sometimes, and this happens in e-commerce sometimes where you raise the price and there’s a higher perceived quality of an item due to the price and it has the opposite effect. I know that happened with my course actually. Once I started raising the price, I actually increased the conversion rate. Just wondering how often that happens in your experience, or people are just very price-conscious in general? Brad: I think on Amazon people are pretty price conscious. That’s one thing always to remember when you’re coming on, when you’re displaying a product on Amazon versus another e-commerce website like your own is in general people like deals when they’re coming to Amazon. It’s built on low price, but that said I think there is some wiggle room in there, and you might be able to adjust that improved perceived value for what you’re doing. Steve: Let’s kind of jump back to the customer feedback, like you were talking about you’re going to dig deeper into the customer feedback. Like what are some things that you can do to affect that? Brad: So you have the four things that we’ve identified and there could be more, I’d love to hear if there’s other cool things that people are doing out there. But number one is, answer all the questions and answer them and make sure your answers are professional and concise and positive. So answer any questions that people have. Number two is the thing when you ask for reviews, we’ve gone through this whole review ups and downs over the last six months or twelve months, asking for reviews and trying to improve your conversion rate under reviews. In general we found it’s like one to 2% conversion rate per review, but when you start asking for them, it can jump up to 5%. Steve: Is that still the case even with the opt out? Brad: So the opt out has cooled back down a little bit, but we still see it improved, and we still use that as a general rule of thumb for everything that we do, because we do see reviews coming in through the emails. Steve: How many emails are people sending, or do you recommend people send? Brad: No more than two, two would be the max. The three click chain, that’s not good. I mean you’re just bugging people at that point in our opinion. Steve: Do you ask for seller feedback first prior to product feedback or what’s your Strategy? Brad: No, just product feedback. Seller feedback is almost useless. At a certain point, no one cares who the seller is. At a certain point if you have good feedback and you can scrap bad feedback, because most the time the bad feedback is about a product anyway. And so at a certain point, your feedback is great, and there’s no reason to have higher seller feedback versus not. No one really cares who the seller is. Brad: Yeah, so the only reason seller feedback matters is on Amazon side. So it doesn’t matter to the customer, but it matters in the Amazon side. And as long as you keep it clean and you have a decent amount of feedback and it’s all about four and a half or four point seven or one whatever the math, I think it’s four point seven, then you don’t really need more, you don’t even want more necessarily. And it will come in, it’ll trickle in, but as long as you’re up that good, then you’re great. Amazon will — it’s kind of like a check box right in there. Mine is looking through things like a check box, and then, oh the seller doing X number of revenue? If they are, we might give him more attention or might give him an account manager or something like that if that’s what you’re trying to go after. Steve: So yeah, once it gets to a certain threshold, then it’s not going to really improve your organic rankings across the board for your product? Brad: No, not at all, not at all. Steve: Cool, hey we’ve been chatting for 40 minutes, is there anything – you’re off again, sorry. Is very anything that you want to add? Brad: Just the last two inputs, customer service, the gen A plus customer service in general, and then obviously the most important thing is an A plus product, making sure your product is not faulty. And that’s hard because of the way up the channel right, you got to make sure that it’s good. But if you have an awesome product and people give you great feedback. Steve: How are you guys dealing with these sellers that just leave malicious feedback or like these hijackers that come and take your buy box and then disappear like in a week, it’s like playing whack a mole, what do you guys account of that? Brad: Yeah we have — and that’s we jump on it as fast as we can, and that’s one of the reasons for brand registry 2.0 is so you can control that a lot more closely, and you can get people off your listing really a lot quicker if you’re the brand owner. They even have — I heard from someone on the team, they have like an SLA [ph] of around like six hours to respond to your inquiries and questions on preference in 2.0. Brad: So that’s what she told us yeah. Steve: So Brad, to end this interview, you want to tell us about some of the services that you offer and give us like a little peek about what your software is that’s coming out? Brad: Sure. So I’ll mention the services first. So essentially we do two things. One, we do these kind of analysis for people, so the stuff we’ve been talking about. They’ll bring their business on; they kind of don’t know where they are, if they should focus on doubling down where they are now, or expanding. And they don’t quite know where they are in the marketplace and what they want to be doing. And so at that point, many people come to us and they say, hey, I’d love a full assessment of my business. So we do these assessments, and it’s a full deep dive, strategic deep dive for people. It takes about two weeks to do from our side, so we look along different angles of their business and what’s going on in the marketplace. And then we give them a report and we talk through it, and talk about things they need to do to improve their business. That’s kind of the first thing we do. The second is we do that and then we do everything for them. Steve: I like that option. Brad: Yeah, it’s the full hands on kind of [inaudible 00:46:11] service. And we run these companies, we run the whole Amazon channel for businesses, big and small, and we say, hey if you want to focus on product development, that’s where your passion is, that’s what you’re really good at, and you don’t want to deal with all the Amazon garbage that happens, we will take over that full channel for you, everything from customer service, PPC optimization to the detailed page opposition. And then we put it in our system and we optimize for profit for them. And we say, hey, look this is what’s going on with profit; we think you should be doing XY and Z. And these are the tasks we want to do this month to improve your margins. So that’s the second thing, and we do a lot of that for clients, is the full on managed service of the whole Amazon channel for them. Steve: Okay, and are you prepared to talk about what’s coming out? Brad: Yes, so I’ll give you a little bit of peek. So we’re very interested in understanding more about who the customers are, and who your customers are. I know for everyone who does Facebook and works through the Facebook side of things, there’s some really cool Facebook analytics and demographic information. We are really interested in tying back kind of together with what’s going on Amazon, and kind of triangulating all the activities that you’re doing on Facebook with Amazon and validating the whole system for people. Steve: Are you saying that we can create audiences based on our purchasers? Brad: That’s where we’re going. Steve: That sounds very interesting. Brad: Exactly where we’re going yeah. There’s that and then we’re also interested in the Amazon marketplace as a whole, what’s going on and things like how many Amazon brand Amazon own brands are there right now, and in what categories are they in. So we’re looking at things like that, and we’d love to make all that public to people to just let them know what’s going on, what Amazon is doing, and then anchor [ph] a little bit more about what your competitors are doing. Steve: Cool man. Well, hopefully Brad will be at the 2018 Sellers Summit. In fact as soon as I hang up here, we’re going to talk about that a little. But thanks for coming on the show Brad, I’m happy to have you man, you did a great job at this year’s summit. Brad: Oh appreciated Steve. The summit was one of my highlights of the whole year to be honest. It’s a great event. Steve: Cool man. I hope to see there again next year. Brad: All right great, thanks. Hope you enjoyed that episode. What I love about Brad is that he’s really approachable, he knows his stuff, and he’s willing to share his knowledge with everyone. For more information about this episode, go to mywifequitherjob.com/ episode186. And once again I want to thank Klaviyo.com for sponsoring this episode. Klaviyo is the email marketing platform of choice for ecommerce merchants, and you can easily put together automated flows like an abandoned cart sequence, a post purchase flow, a win back campaign, basically all these sequences that will make you money on auto pilot. So head on over to mywifequitherjob.com/K-L-A-V-I-Y-O, once again that’s mywifequitherjob.com/K-L-A-V-I-Y-O. Now I also want to thank Privy.com for sponsoring this episode. Privy is the email capture provider that I personally use to turn visitors into email subscribers. They offer email capture, exit intent, site targeting tools to make it super simple as well. And I like Privy because it’s so powerful and you can basically trigger custom pop ups for any primer that is closely tied to your e-commerce store. If you want to give it a try, it’s free. So head on over to Privy.com/Steve, once again that’s PRIVY.com/Steve. Now, I talk about how I use all these tools on my blog, and if you’re interested in starting your own ecommerce store, head on over to mywifequitherjob.com and sign up for my free six-day mini course. Just type in your email, and I’ll send you the course right away, thanks for listening.